Anand Gnanaraj, et al. ‘Stuck’ Mitral Bio-Prosthetic Valve. (2016) J Heart Cardiol 2(2): 56-58. © 2016 Suma M Victor. This is an Open access article distributed under the terms of Creative Commons Attribution 4.0 International License. Early valve thrombosis (within one year) in patients with bio-prosthetic valves is extremely rare. This particular patient presented within one year after mitral valve replacement with a picture suggestive of subacute valve thrombosis. The valve showed narrowing of the effective orifice with thrombus and pannus formation. A 26-year-old lady was evaluated at our hospital for rheumatic mitral valve disease in March 2007. She underwent Mitral Valve Replacement (MVR) with a bio-prosthetic valve (Bio-cor - 27 mm) in April 2007. She was discharged on the 9th day with stable hemodynamics and optimized INR values. During follow up she had optimal INR values and normal gradients across the valve. After three months of adequate anticoagulation her warfarin was stopped since she was in sinus rhythm. She continued to take aspirin and remained in sinus rhythm. She was advised infective endocarditis prophylaxis. Eleven months after MVR she developed breathlessness over one week, which gradually worsened to orthopnoea. On admission she had pulmonary edema and the gradients across the bio-prosthetic mitral valve were increased (Maximum of 34 mmHg and Mean of 24 mmHg). Her previous echocardiogram in July 2007 showed normal gradients across the valve. Her transthoracic and transesophageal echocardiograms were suggestive of a stuck mitral prosthesis (Echo figures). There was a mobile membranous structure that appeared like a detached valve apparatus but could not be clearly delineated pre-operatively. We assumed that it was an unstable prosthetic structure. 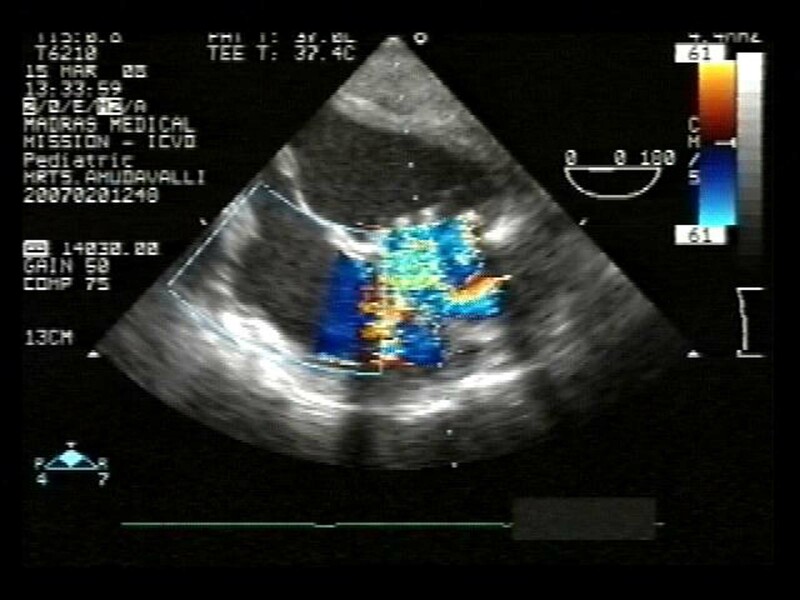 The intra-operative echocardiogram also showed similar features. Direct inspection of the valve revealed a fibrous tissue overgrowth almost completely obstructing the valve orifice (Figure 1). 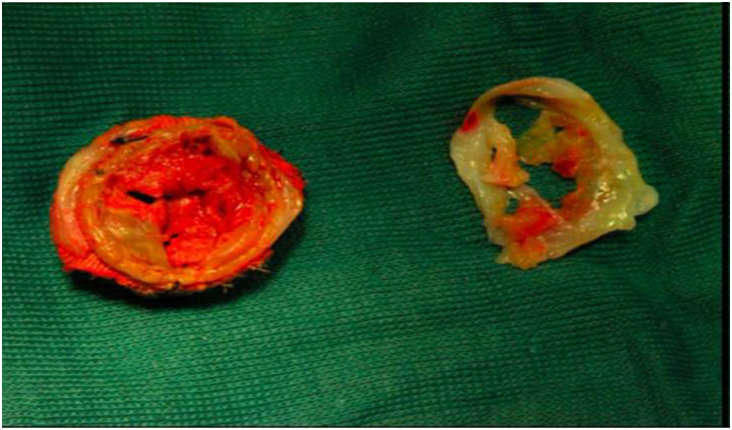 There was thrombus on the valve between the pannus like overgrowth and the bio-prosthetic valve leaflets and on the left ventricular side of the mitral prosthetic valve. (Figure 2) The leaflets of the bio-prosthesis were structurally normal and opened normally, both in-situ and after explantation. There was no left atrial thrombus. The fibrotic tissue was removed and the valve was explanted and replaced with a St. Jude bileaflet mechanical prosthesis. She had an uneventful postoperative period and was discharged on adequate anticoagulation. Her early follow up showed normally functioning mitral mechanical prosthesis and she was asymptomatic. Valve thrombosis is a complication predominantly occurring with mechanical prosthetic valves, especially in the mitral position. Valve thrombosis with bioprosthesis is rare. Very few cases have been reported with bio-prosthetic valves, especially in the first year. Bio-prosthetic valve ‘pseudo stenosis’ has been reported in patients with complete preservation of the mitral apparatus. Mixed prosthetic valve dysfunction caused by a membranous pannus growth, with a central orifice, over a mechanical prosthetic valve has been reported. Early bioprosthetic dysfunction after radio frequency ablation (MAZE procedure) for atrial fibrillation is known to occur. Bioprosthetic valve thrombosis usually occurs in the early postoperative period, before endothelialisation of the suture zone is complete. Hence, patients are anticoagulated for the first three months postoperatively, particularly for bioprosthesis at mitral position. The occurrence of a pannus and a thrombus in a bioprosthetic valve nearly at one year is extremely unusual. In this case the exact reason for rapid pannus formation is not known. In literature, three factors are known to predispose to thrombus formation on a bioprosthesis, they are endothelial, haemodynamic and haemostatic factors. 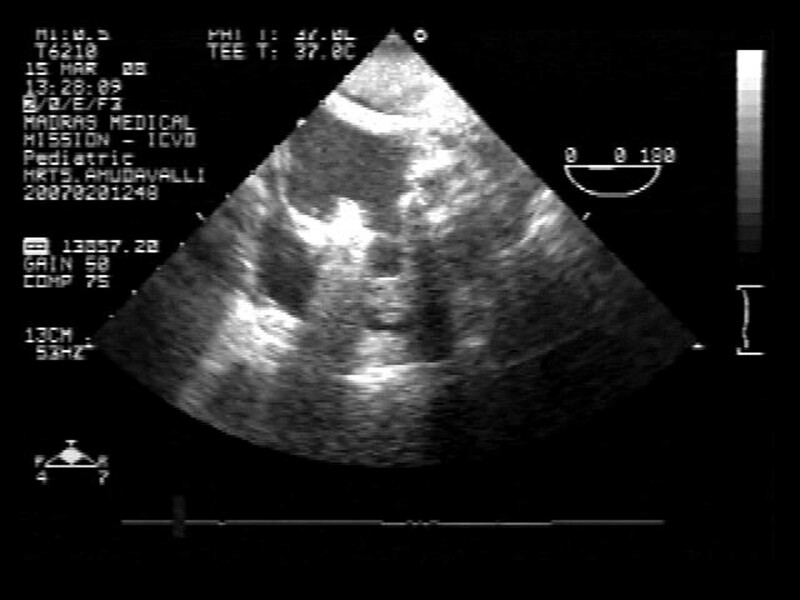 The typical presentation is of acute pulmonary edema and transthoracic echocardiogram is essential in diagnosis. Cinefluoroscopy may not contribute in diagnosis. Surgery is a preferred option of treatment in these patients[9,10]. 1. Roudaut, R., Serri, K., Lafitte, S. Thrombosis of prosthetic heart valves: diagnosis and therapeutic considerations. (2007) Heart 93(1): 137-142. 2. Heras, M., Chesebro, J.H., Fuster, V., et al. High risk of thromboemboli early after bioprosthetic cardiac valve replacement. (1995) J Am Coll Cardiol 25(5): 1111-1119. 3. Korkolis, D.P., Passik, C.S., Marshalko, S.J., et al. 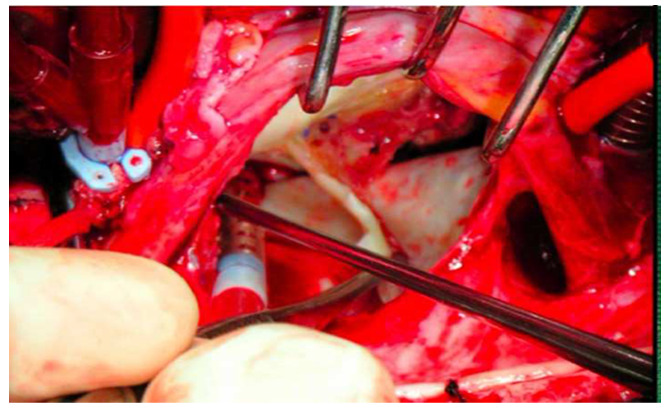 Early bioprosthetic mitral valve Pseudostenosis after complete preservation of the native mitral apparatus. (2002) Ann Thorac Surg 74(5): 1689-1691. 4. Darryl, A.C., Eoin, N.S., John, B.C., et al. Thrombotic pannus causing mixed prosthetic mitral valve dysfunction. (2002) Eur J Cardiothorac Surg 22(2): 312. 5. Masakazu, N., Lim, L.S., Leng, C.Y. Bioprosthetic mitral valve thrombosis in a patient in sinus rhythm after the radiofrequency maze procedure. (2006) J Thorac Cardiovasc Surg 132(6): 1464-1465. 6. Gencbay, M., Turan, F., Degertekin, M., et al. High prevalence of hypercoagulable states in patient with recurrent thrombosis of mechanical heart valves. (1998) J Heart Valve Dis 7(6): 601-609. 7. Habib, G., Cornen, A., Mesana, T., et al. Diagnosis of prosthetic heart valve thrombosis, the respective values of transthoracic and transoesophageal doppler echocardiography. (1993) Eur Heart J 14(4): 447-455. 8. Montorsi, P., De Bernardi, F., Muratori, M., et al. Role of cine-fluoroscopy, transthoracic, and transesophageal echocardiography in patients with suspected prosthetic heart valve thrombosis. (2000) Am J Cardiol 85(1): 58-64. 9. Roudaut, R., Roques, X., Lafitte, S., et al. Surgery for prosthetic valve obstruction. A single center study of 136 patients. (2003) Eur J Cardiothorac Surg 24(6): 868-872. 10. Alpert, J.S. The thrombosed prosthetic valve. Current recommendations based on evidence from the literature. (2003) J Am Coll Cardiol 41(4): 659-660.